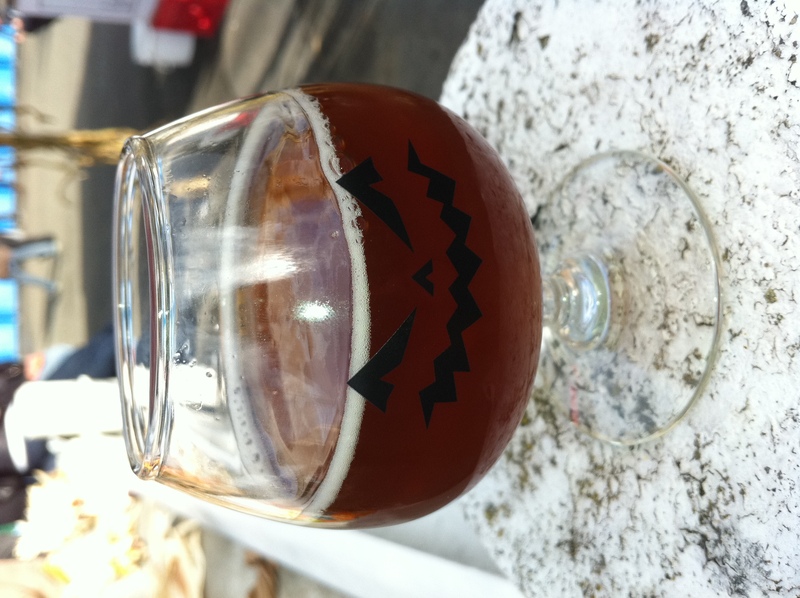 Inspiration for pumpkin beers comes not just from colonial American history and the cooking of the harvest season, but from international cuisines in which pumpkin is used. This is the first appearance by Coche de Medianoche (Midnight Coach–get it? ), a Mexican-themed (and flavored) beer which struck me when I was looking at a recipe for a snack mix using pumpkin seeds. This beer is about the spicing–cinnamon, cumin, black pepper, pan-roasted guajillo chilies (thanks, Whitney) and two kinds of cayenne pepper–both the Indian and the super-fiery African, in moderation. There are also roasted pumpkin seeds in the mash. A late addition, in conditioning, of fresh epazote from the Prosser Farms run by Tom Douglas Restaurants (thanks again! ), gives the Coche an intriguing and unique herbaceous touch. Brewed with pale, Munich, dextripils and chocolate malts with roasted barley and roasted pumpkin seeds, with pumpkin in the mash, kettle and fermenter. Bittered with Magnum and finished with New Zealand Motueka. SG 17.4 P/1.070. Alcohol 6.2% by weight, 7.5% by volume. Coche de Medianoche started off like many of its brethren before it–it pours an auburn with caramel highlights. However, this beer was relatively murky, but had the similar ring of foam head we’ve seen before. The nose on this beer is FULL of pepper with the chilies struggling to make their presence known. Wow, this nose is huge. Here’s the taste breakdown: pepper, then pumpkin, then pepper again before finishing with a big chili bite. Sweet, but faint hints of honey and cinnamon appear between the spices to help balanced out the eye-watering spiciness. As it warms the green chilies really start to dominate the flavor. I would have liked for the cinnamon to pop more, but it’s obvious that the chilies were calling all the shots. Mouthfeel is light, but spicy as hell! It dries out on the way down, leaving a definite burn along the gums and throat. This may be my favorite beer of the event! Coche de Medianoche adds just enough spice to the tradition autumn flavors to create something I have never seen (or tasted) before. I’m quite glad I did not listen to the bartender’s warnings.